Nepal is blessed with 8 out of 10 highest peaks in the world and Nepali people are proud of it. I am going to present some photos and details of the ten highest peaks in this post. 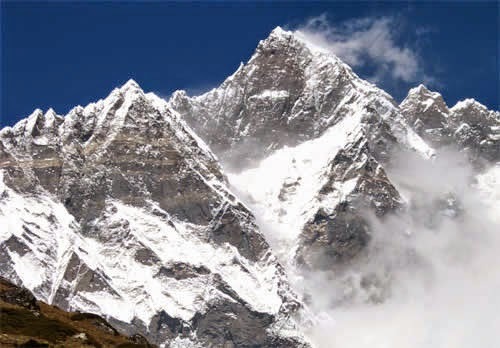 The following is a list of the world’s 10 highest mountains per height above sea level, all of which are located in central and southern Asia. In fact, all 7,000 m (23,000 ft) peaks in the world are located in the central of Asia (East Asia, Central Asia and South Asia) in a rectangle edged by Noshaq (7,492 m (24,580 ft)) on the Afghanistan-Pakistan border in the West, Peak Jengish Chokusu, (Tuōmù’ěr Fēng) (7,439 m (24,406 ft)) on the Kyrgyzstan – Xinjiang border to the North, Gongga Shan (Minya Konka) (7,556 m (24,790 ft)) in Sichuan to the East, and Kabru (7,412 m (24,318 ft)) on the Sikkim – Nepal border to the South. 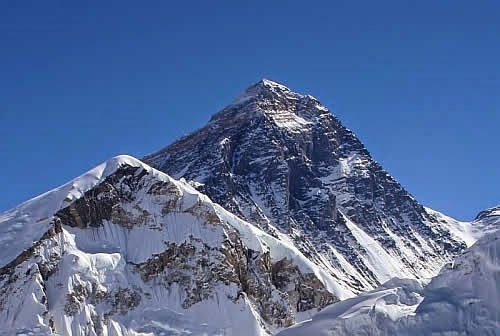 The highest peak in the world, Mount Everest is also called Qomolangma/Chomolungma (Tibetian) and Sagarmatha (Nepali). Chomolungma in Tibetian means “Mother of the Universe” or “Goddess Mother of the Snows” and Sagarmatha in Nepali means “Head of the Sky”. Climbing on the Everest is not that hard, but that doesn’t mean anyone can do it. Specialized help is needed and that doesn’t come in cheap, not to mention the gear needed. 210 died while trying to climb the Everest, most of them in the “death zone” where the conditions are extremely critical (the amount of oxygen cannot sustain human life). 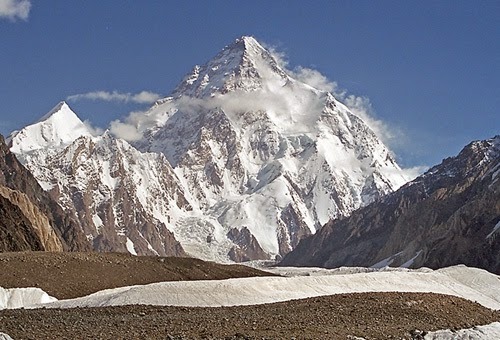 K2, the second-highest mountain on Earth, is located in the Karakoram segment of the Himalayan range, on the border between the Gilgit-Baltistan region of the Pakistan administered Northern Areas and the Taxkorgan Tajik Autonomous County of Xinjiang, China. 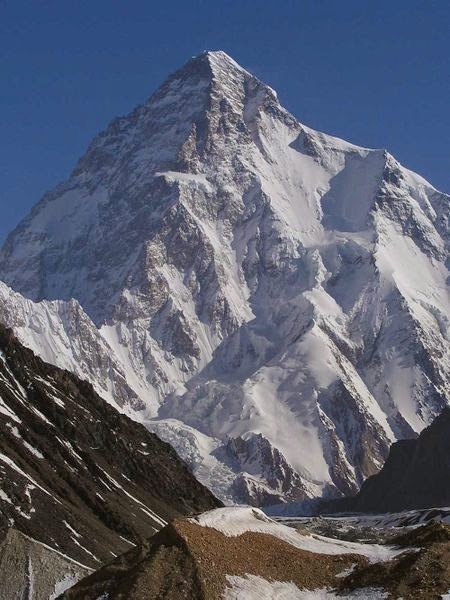 K2 is located in the Northern part of Pakistan and is part of the Karakoram segment in the Himalayan range. Famous for its nickname (if we can call it that way) – the Savage Mountain – it’s famous for the fact that out of four people who try to climb on K2, one of them dies trying. It’s the second deadliest mountain in the world. Highest elevation is 8,611 metres (28,251 ft). Kangchenjunga translated means “The Five Treasures of Snows”, as it contains five peaks, four of them over 8,450 metres. “The Five Treasures of Snows” – is the third largest mountain in the world and consists of five peaks with four of them, above 8,450 m high. Buttressed by great ridges roughly from the east to the west and from north to south, the large massif of Kangchenjunga is formed as a giant ‘X’. Highest elevation is at 8,586 metres (28,169 ft). 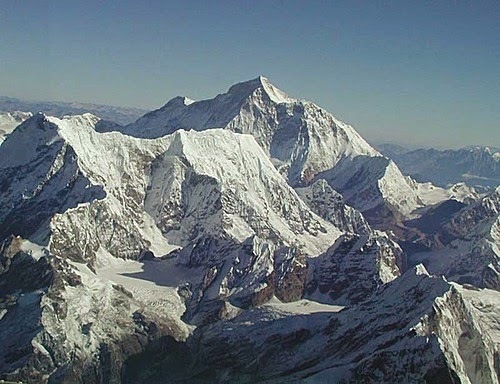 This peak is connected to Mount Everest via the South Col. In addition to the main summit at 8,516 metres above sea level, Lhotse Middle (East) is 8,414 metres and Lhotse Shar is 8,383 metres. The rises 3.2 km (1.98 mi) in only 2.25 km (1.4 mi) of horizontal distance, making it the steepest face of this size in the world. 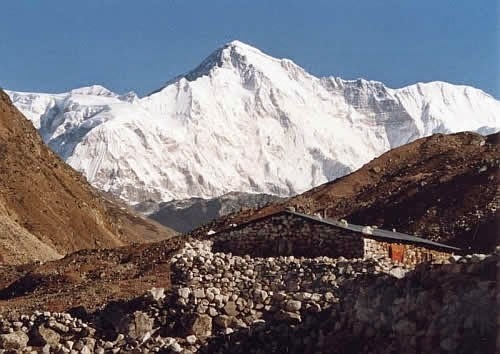 Lhotse is best known (for professional climbers) for its direct connection or proximity to Mount Everest via the South Col and the fact that its tremendous south face is the steepest face of this size in the world : rises 3.2 km (1.98 mi) in only 2.25 km (1.4 mi) of horizontal distance. Maximum elevation is 8,516 metres (27,940 ft). Makalu is located 22 km (14 mi) east of Mount Everest, on the border between Nepal and Tibet. Makalu is an isolated peak whose shape is a four-sided pyramid. Makalu is an isolated peak located 22km east of Mount Everest, that has the shape of a four-sided pyramid. Considered one of the most difficult mountains in the world to climb, because of its steep pitches and knife-edged ridges that go up to 8,462 metres (27,762 ft). Cho Oyu means “Turquoise Goddess” in Tibetan. It lies 20 km west of Mount Everest, at the border between China and Nepal. Cho Oyu – the Turquoise Goddess – lies 20 km west of Mount Everest, in the Himalayas, on the Chinese and Nepalese border. It’s not a very steep peak and most climbers consider it one of the easiest to ascend on even though it elevates up to 8,201 metres (26,906 ft). 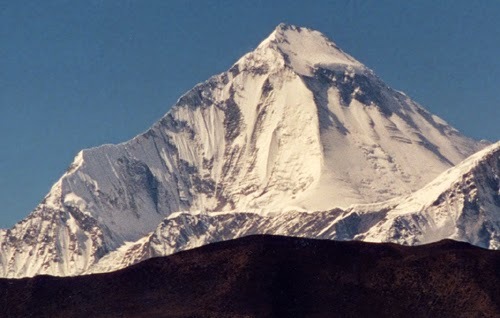 Dhaulagiri means “White Mountain” the White Mountain – is part of a a subrange of the Himalayas (Dhaulagiri Himal) which lies northwest of Pokhara in the north central Nepal. Highest peak is at 8,167 metres (26,795 ft). 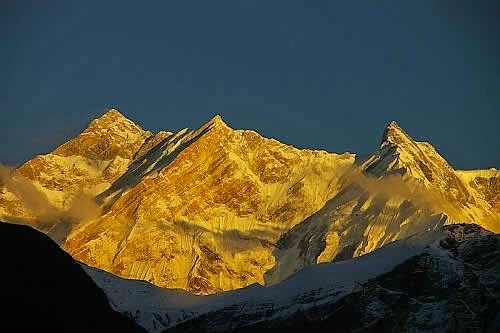 Manaslu is derived from the Sanskrit word Manasa and is translated as “Mountain of the Spirit” The subtle changes of the light on the ice of Manaslu are terrific, turning from grey to pink to orange to yellow and then the ‘regular’ white. 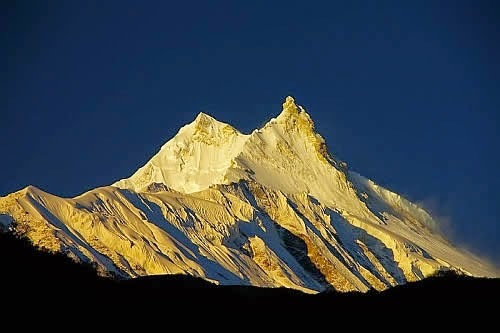 Manaslu, the highest peak in the Gorkha district is located in the the Mansiri Himal, part of the Nepalese Himalayas, with a lot of long ridges, valley glaciers and a steepy scenery. Highest peak is at 8,163 metres (26,781 ft). Nanga Parbat means “Naked Mountain” in Hindi. 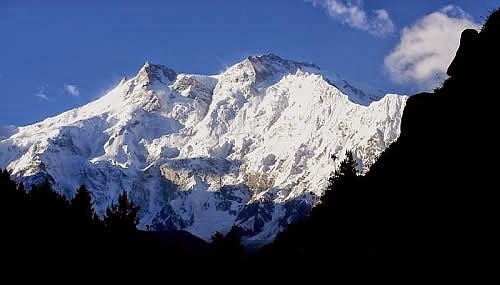 Nanga Parbat, which means the Naked Mountain in Urdu, it’s also known as the Killer Mountain mainly for the extremely serious climb where lots of climbers died in the first half of the twentieth century. The highest elevation is 8,126 metres (26,660 ft). Annapurna is a Sanskrit name which is translated as Goddess of the Harvests. Annapurna is series of peaks in the Himalayas with the highest reaching 8,091 m (26,538 ft). The peak that refers to the goddess of fertility and agriculture in Hinduism, is part of a 7,629 sq. km conservation area (first and largest) in Nepal. Some say that’s the deadliest mountain of them all, with a fatality rate of 40%.